Release Date: March 7th, 2014. Storyline: The Persian military offensive is in full effect, while the mighty Greek empire seeks to halt Persian advances. Themistokles battles to strengthen his army by uniting Greek city-states on all fronts. Meanwhile, the Spartans mourn for their loss, and Themistokles is forced to battle a new, brutal Persian navy commander. We didn't see anything positive in this film. The script was terrible, the acting was terrible, the cinematography was terrible, and the entire movie was... you've guessed it: terrible. 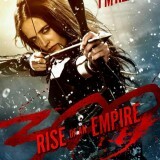 If you haven’t seen the first 300, that one is a bit more worth your time; because 300: Rise of an Empire is the sequel. The film revolves around the same plot as its predecessor: The Persians are monsters that can only be stopped by the might of Greece. However, the big new twist in this film was the idea that Athens, NOT SPARTA, was the supreme defender of Greece. In fact, the end-goal of the Athenian army was to unite all the city-states of Greece under one invincible force. Now, while the plot sounds good – a bit generic, but good – it was poorly executed, which forced the entire film into a dangerous nosedive. The only fantasy surrounding this film is the idea of it actually being anything short of garbage. 300: Rise of an Empire is officially in the running for ‘Worst Film I’ve Ever Seen’. In fact, it may be at the top of the list. It’s classified as an Action/Drama/Fantasy, all of which are fallacies. The action in the film is horrendous, filled with constant, boring slow-motion scenes. The drama in the film is also horrendous, in part because of the terrible cast they had, but mainly because of the awful script. The only fantasy surrounding this film is the idea of it actually being anything short of garbage. I know, that seemed really harsh, but feel free to watch it and you will quickly agree with my critique. The script is awful, I am actually considering placing fliers around Hollywood saying “DO NOT HIRE THESE WRITERS ________ …” To help the cause of poor writing, the cast starring: Lena Heady, Eva Green, Sullivan Stapleton. These actors, I’m sure are better actors than I. However, in this particular film, my dog could have done better. The actors over-emphasize each line, as if all peoples in ancient civilizations spoke to each other as if the world were ending. Maybe it was just the English accents, but that wouldn’t explain the other films IN THIS EXACT GENRE, that were brilliant successes: Gladiator, Apocalypto, Robin Hood. The harsh, unfortunate truth, is that these actors had the potential to do this film a great justice, but instead slaughtered it. Let’s get off the tails of the writers, and actors; and instead move onto something far worse – the cinematography. The graphics and scenery in this film make it that much harder to say anything good about this film. Throughout the entire film, there is a constant darkness; even when the scene is meant to be bright, it’s dark. The animations look like something out of the 1980’s, which is embarrassing for a film in this day and age. This film is generic, boring, and bad enough to make me cringe just by thinking about it. If you feel like watching it, by all means go ahead; feel free to rent the film from any provider you find. However, do not say I didn’t warn you. Find the most competitive price for 300: Rise of an Empire in the table below. If viewing from a mobile device please click on + to get more information.